Last week, I picked up a copy of Robert MacFarlane’s ‘Landmarks’. 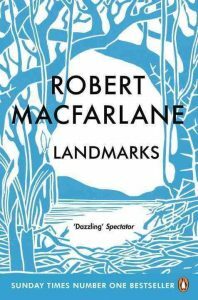 I had read all of his previous works and seen reviews of ‘Landmarks’ online from the UK. MacFarlane’s book got me thinking about community assets, language and maps. As well it brought to mind other books and documentaries I have experienced over the years, and lost communities. I could relate to his anecdotes and celebration of language. I have made a selection of the anecdotes that struck me particularly that will help illuminate this discussion. ‘When the head of children’s dictionaries at OUP was asked why the decision had been taken to delete those ‘nature words’, she replied that the dictionary needed to reflect the consensus experience of modern-day childhood’. Here are the questions ‘Landmarks’ leads me to ask. – How much of our perception of a landscape is determined by local language? – How does that relate to our efforts to describe landscape in map form? – What do we chose to map? – What do we choose to ignore? A local example of landscape influencing language can be found in the writing of Ernest Buckler. Buckler is likely the province’s best known Canadian author. Ernest’s use of language was recently reinforced for me, when I had the opportunity to view the documentary video on his life and writing. (See the 1993 documentary by Chuck Lapp: ‘Inner Mountains, Inner Valleys’). Here was a writer whose very use of language was impacted by the landscape around him and the people living in that landscape. In Nova Scotia, as in other parts of Canada, there is a concern for the ’emptying out of the rural communities’. (See links to the Ivany report below).One of the strategies for reversing the emptying communities appears is ‘asset mapping‘. Asset mapping can mean many different things and as such is an inherently confusing term to use in any article without a definition. Here is a useful one that we can use to clear that up. One of the leading proponents of asset mapping is John Mcknight (see link below). He developed the Asset-based Community Development (ABCD) approach. In a rural setting, asset mapping might include the location of craft breweries, wineries, cider factories, the availability of rural properties or bicycle trails to ‘lost settlements’. Given what exists today, how can these assets be leveraged to reverse the trend of outmigration from communities? If we agree that there is a relationship between landscape and language. What exactly do we mean by an ‘asset?’ Are we talking about a re-birth of agriculture? Are we talking about ‘lost settlements’? Is it just economics or is there a larger ecological view of the landscape? MacFarlane in ‘Landmarks’, has assembled glossaries of words (or his term ‘word-hoard’) for different landscape features as well providing a commentary on key British ‘Nature’ writers that have influenced his thinking e.g. Nan Shepherd, Roger Deakin, and JA Baker. Perhaps, we should be attempting something similar in Canada to avoid the desecration of the landscape. What about the mapping component of asset mapping? What tools do they use? Do they use GIS software or is it as simple as a pen and paper sketch book? For example, Marcel Morin has recently published a book on the Landscapes of Grand Pre. This could be considered a form of asset mapping.The small book includes a variety of historic images, drone and landscape photographs. Morin works for Lost Art Cartography. Another local example of how asset mapping could be helpful is the ‘lost community’ of Roxbury. How do we save an historical community asset? We map it. 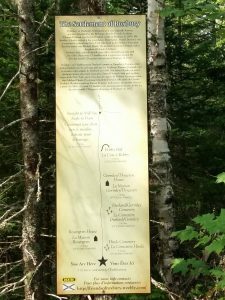 Dave Whitman and the Friends of Roxbury have made a significant investment by writing a book about Roxbury and maintaining the trail and signage. Kudos to them for their work. Through books we can see that the language we use, whether words or graphics is important to our understanding of our landscapes and assets. This stands to reason as landscape and language are closely intertwined. What we observe, the words we use to describe it, and how we share our observations, including images, are all connected. If we use a rich, diverse language to describe our environment then there is less likelihood of desecration. As well if we leverage tools like asset mapping we can do much for our communities. Chuck Lapp. 1993. Inner mountains, inner valleys. The Life and Writing of Ernest Buckler. DVD. David Whitman. Lost in the Woods: the Lure and History of Roxbury. Bailey Chase Books. Marcel Morin. 2016. The Landscapes of Grand Pre. Images,maps, past and present. Published by the Grand Pre Trails Society. Links to the Ivany report: NOW or NEVER – an urgent call to Action for Nova Scotians. One comment on "Fall Reading in Canada: landscape, language, geography"
On the comment of removing of “nature” words: this well illustrates the close-mindedness of society today. Because the commentator lives in a city and had probably never experienced nature, from their perspective, nature is something one sees in photos and therefore is not worthy. Though 90% are urban dwellers, one cannot dismiss those who do not.